Showcase Central Hints, Tips & Other Documentation - Where Does Showcase Central Fit? The online world is an interesting, diversified place with many ways of providing information to the on-line data consumer. Some information comes in tiny bursts from individuals, while other sites provide an overwhelming amount of corporate data. Some of it is relevant for a few minutes while other information may be important for years after it is posted. There are sites that specialize in video, or on-line shopping, or current news, or perhaps individual opinions, social networking and encyclopaedic information. Many sites encourage feedback from viewers, while other sites give people an outlet for their own causes, concerns or frustrations. There are other sites that are portals to websites within the same industry or are databases of collected site information that can be searched. Some sites provide advertising space in the form of banner ads for which you pay when chosen. Showcase Central is a unique, multilingual marketing and networking platform designed to complement the other on-line endeavours that you, your organization or your company may be using. A showcase is focused on your products or services and gives you a venue to promote them in a timely manner and to elicit feedback from the on-line community both within Showcase Central and by linking to popular social networking sites. 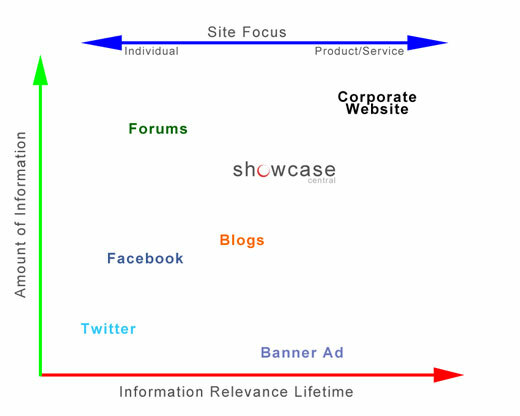 A showcase provides more information than a banner advertisement, but less information than a corporate website. It gives you a way to send a single, focused message to your target market at any given time. A corporate website provides all your corporate information when people want to find out more. A showcase can be made part of a virtual community that mirrors your own business community, or one that has no geographical boundaries. Combining your showcase with other showcases will help with your search engine rankings as well as giving viewers a way to find your information within a logical grouping. Showcase Central helps by providing groupings for various communities such as businesses, real estate listings, individual portfolios and more.